Why Oracle, Cracker Barrel, and United Natural Foods could make big moves over the next few trading days. Stocks were headed for a flat finish last week before a sharp pullback on Friday pushed shares lower. The Dow Jones Industrial Average (DJINDICES:^DJI) and S&P 500 (SNPINDEX:^GSPC) each gave up nearly 2% of year-to-date returns, to roughly 4%. The trading week ahead will bring plenty of news that's likely to spark big moves in stocks. In particular, investors will be watching Oracle (NYSE:ORCL), Cracker Barrel (NASDAQ:CBRL), and United Natural Foods (NYSE:UNFI) over the coming days as the companies release updates on their latest business trends. United Natural Foods, the nation's largest natural and organic food distributor, kicks things off with its earnings report on Monday afternoon. Expectations are low for this outing, given that sales have only risen by 2% over the past nine months, as profitability ticked lower. United Natural Foods is facing rising competitive pricing pressures that have pushed gross margin down lately. Its customers, meanwhile, have their own challenges that could negatively impact the distributor. Sprouts Farmers Market, for example, said last week that grocery price deflation and heavy discounting in the organic and natural food industry were responsible for a surprising slowdown in its sales growth. The company's executives said in early June that they expect a stronger presence in fresh produce to help sales rise to roughly $8.5 billion in the fiscal year results that it posts this week. If a softening industry gets in the way of that goal, the stock could tumble. Cracker Barrel shares are riding high heading into the restaurant chain's earnings report on Wednesday. 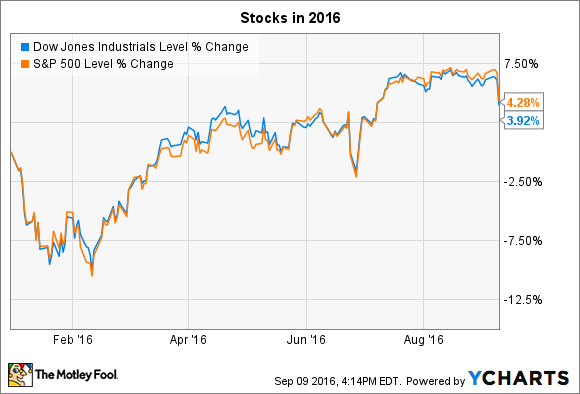 The stock has significantly outperformed industry peers, and surged 20% higher so far in 2016. There are good reasons for that bullishness on the part of investors. Operating income jumped by 21% last quarter thanks to cost cuts and steadily rising demand on both the retailing and food service sides of the business. Cracker Barrel's bottom-line margin is 6.4% of sales over the last nine months, marking a major improvement over the prior year period's 5.5%. The company last posted 2.2% higher retail comps and 2.3% higher restaurant comps, which is roughly what management has projected for the current quarter. Many industry peers have announced a slowdown in customer traffic, though, so it will be interesting to see if Cracker Barrel can keep up its market-beating growth even as the casual-dining segment contracts. Oracle is due to post earnings results after the market closes on Thursday, September 15, with investors gaining optimism that business trends are improving. In fact, consensus estimates call for the database titan to post 3% higher sales to mark its first uptick in that metric since the final quarter of 2014. ORCL Revenue (Quarterly YoY Growth) data by YCharts. 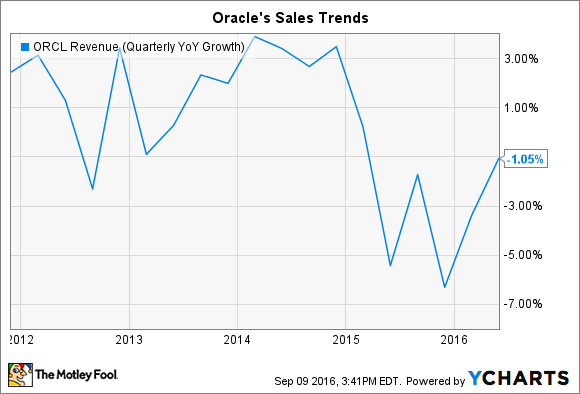 Oracle's cloud-based revenue performance will be key to that rebound. Its software-as-a-service (SaaS) and platform-as-a-service (PaaS) segments are forecast to rise by as much as 80% after significantly outpacing management's guidance in calendar Q1. Margins on those sales are also trending higher, reaching 56% last quarter. Investors will be looking for more progress in these growth businesses on Thursday, even as Oracle's legacy hardware and software products continue to decline. Over the longer term, management aims to become the first cloud company to pass the $10 billion mark for PaaS and SaaS, which will require years of consistently strong sales growth.